there is so many tanks with spaced armor and i dont really know where to shoot them to pen reliably. the tank that still overpowers me the most is the Conqueror/S Conqueror. while looking at Tanks.GG there seems to be 30-70% chance to pen the turret with WZ-111 1-4's top guns HEAT shells. yet when i keep firing at it, the shells do nothing. i have tried over and over again but with no results… and AP shells just ding off as well. so instead of coming here demanding WG to nerf both Conquerors, i seek helps. i personally think that HEAT shells should be buffed as there is so much downsides when firing them… Tracks, Spaced armor, Walls and other Obstacles and it even flies slower than any other shell type. APCR is superior in everyway i can think of. and the sad side of the story is that most of Chinese tanks fire HEAT shells as their Special Ammo. HEAT is mainly good for thick armor with flat surfaces. Unlike APCR it isn't just AP with more pen and better shell velocity, but with actual disadvantages to compensate for the (often massively) increased penetration values. Edited by Geno1isme, 08 April 2019 - 02:58 PM. for sniping i understand why Heat would be better but at close range where most HTs are most of the time. APCR is better as the penetration drop dont take effect when fired at point blank range. SuperConq is one of the better designed tank from one point of view. the turret is strong enough, so you just can't press 2 and pen it. The bad part about Super Conq design is the "no turret weakspot". The best way to deal with SuperConq is to shoot lfp or sides. If it is hulldown, shoot HE or just leave it and don't go in front of it, or rush it down with a few allies (if he doesn't have support. Why would you fire premium in a premium vehicle? If it is to break even or make few credits per battle,why even play premium tanks? because im not going to lose a game just because i did not dare to spend some internet currency. i do understand that there has to be some things that you can not pen. but numbers dont lie there should be a good chance of penetration when a HEAT shell lands. Why not play tier 6 for fun, instead of tier 8? This game is moving in a very stupid direction, where people are paying to basically having a F2P experience, making it impossible to grind Tier 9 tanks and play tier 10, because now to compensate for losses on a Tier X game I have to play several tier 8 games, and if you are spamming gold on tier 8 premiums you are not even making that. Why don't players play lower tiers instead of spamming gold in tier 8 battles? Edited by pecopad, 08 April 2019 - 05:08 PM. let me correct myself a little bit, i only fire gold when the very next shot decides who wins the game. usually in 4 vs 4 situations when all others have died away already. i dont go into games with gold preloaded. the expectation might be Somua SM as 35 seconds is a long time to reload when a tank that you cant pen comes around a corner. Edited by The_Naa, 08 April 2019 - 05:29 PM. What's wrong with 340mm pen at tier 9? HEAT is an HE variant, of course it'll have trouble with obstacles and spaced armor but most of the time you'll go through most things with that much pen. Also while HEAT doesn't have normalization like AP and APCR, it'll bounce at 85° not 70° like these two. HEAT doesn't lose penetration over distance so if it hits, most likely will pen. The shell velocity isn't suitable for that though. Because penning a premium round gets you credits whereas bouncing standard rounds because you are too cheap to fire premium loses you credits. my problem is the Spaced armor. its annoying. If you are talking about the Conqueror turret then HEAT perform much better than APCR because of the higher ricochet angle. Also fighting a hull down Conq. is not a good idea! sometimes i must. i cant run away every time i see a hull down Conq………..
though, that might be what BravelyRanAway would do. Why not play tier 8 for fun instead of (or as well as) tier 6? Are you the fun police? If he is in a strong position with support, you can't do much to him. But I still should be Pen the turret with HEAT if the numbers in Tank.GG are not lying. They can sometimes be wrong. Like sides of WV was wrongly displayed. 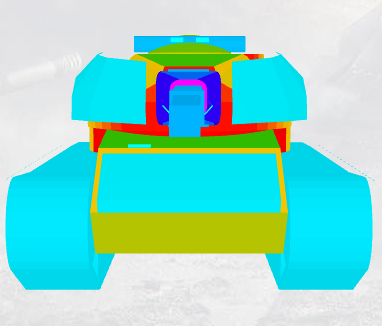 Spaced armour is sometimes missing on tanks.gg and the SC have loads of spaced armor at turret. Why the quotation marks? Even if shooting from slightly above the S.Conq, there is literally a pixel-sized slip that can be penned. If shot from level or below, there is basically no way to pen it. The difference between S.Conq and other good hulldown heavies is the fact that S.Conq gets 10 degrees of gun depression, 0,32 accuracy, low aiming time, one of the highest DPM of tier 10 heavies and 326mm of AP-based ammo penetration. Edited by Laatikkomafia, 09 April 2019 - 10:35 AM.